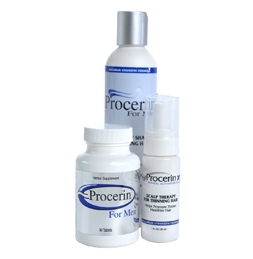 Procerin for Men consists of three separate components that can be used individually or together, for best results. Procerin tablets and Procerin XT Foam work together synergistically to reverse hair loss and help you regain your hairline. Procerin is an all-natural supplement available without a prescription. Procerin comes in a convenient tablet form and topical solution that are used daily for the treatment of male hair loss. Procerin Scalp Therapy Shampoo is a scientifically developed shampoo designed specifically to fight the causes of male hair loss. Procerin Tablets: Procerin is an all-natural supplement available without a prescription. Procerin comes in a convenient tablet form and topical solution that are used daily for the treatment of male hair loss. Procerin is effective in reversing hair loss in men caused by androgenetic alopecia, the most common cause of male hair loss. Androgenetic alopecia results in thinning hair and the familiar receding hairline seen in most cases of male hair loss. Procerin XT Foam: The Procerin Hair Loss Solution: Procerin is recommended For men seeking faster results for hair regrowth, Procerin XT Topical Activator Serum should be applied directly to the scalp. Procerin XTs active ingredients block the vbinding of DHT to receptors on the hair follicle, and stimulate new growth in the crown and temple area. Procerin tablets and Procerin XT serum work together synergistically to reverse hair loss and help you regain your hairline. Procerin Shampoo Procerin Scalp Therapy Shampoo is a scientifically developed shampoo designed specifically to fight the causes of male hair loss. Procerin Scalp Therapy Shampoo is an easy and effective way to fight male hair loss without prescription drugs or side effects.